Amateur radio enthusiast Adrian Lane has managed to get in touch with astronauts on the International Space Station (ISS) right from his backyard shed. Speaking to the Telegraph, the 52-year-old Lane explained how he plotted the orbital route of the ISS before tuning into the ISS's amateur radio signal and sending out his own unique signal. To his surprise, an American ISS crew member answered back. The two were able to talk for about 50 seconds before they lost contact. 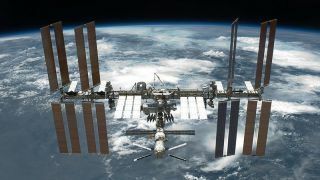 Technically, anyone can call up the ISS, as the ISS publishes the frequencies it uses for its amateur radio on its website, and in fact, invites those interested to try and make contact. "Some ISS crew members make random, unscheduled, amateur radio voice contacts with earth-bound radio amateurs, often called 'hams'," the website notes, adding that astronauts have previously "have contacted thousands of hams around the world" during their breaks. So, really, all you need is a 2-meter radio rig and lots of time, and you might just get lucky enough to get through to an ISS crew member.